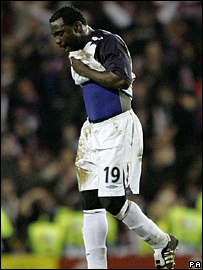 Rangers striker Jean-Claude Darcheville says his miss against Lyon in the Champions League clash at Ibrox cost his side a place in the last 16. "I don't want to make excuses but the ball gave a little bobble. But I should have scored," said the 32-year-old. The Frenchman, who was later sent off in the 3-0 defeat, said it was the biggest disappointment of his career. Rangers needed a point against Lyon on Wednesday to progress to the knockout stages of the competition. But the French champions joined Group E winners Barcelona in the last 16 after winning 3-0 at Ibrox. Darcheville, who was brought on with 20 minutes remaining, blazed over the crossbar from five yards after a superb pass from Barry Ferguson. Lyon were leading 1-0 at that stage, and Darcheville said he was disappointed not to score. "I knew the importance of the game, I'm a very experienced striker and I knew that was an important moment in the game," he said. "I was sure I was going to score and it would've given us a great chance to qualify." Rangers team-mate Steven Naismith said the players were not blaming Darcheville for the Ibrox club's exit. "Darch's miss would have changed everything but that's football," said Naismith. "Some will say it was a bad miss but we are right behind him. We win as a team and lose as a team. Nobody is pointing fingers at him." Rangers manager Walter Smith was frustrated to see Rangers slip into the Uefa Cup after losing to Lyon. "The Uefa Cup isn't a great consolation but maybe in the next few days we'll appreciate it a bit more," he said. "It was a disappointing result and disappointing performance overall. "We'll sit down and reflect in the next few days. We've enjoyed some good experiences and some bad ones as well. I'm sure it will help their careers."